Vdara Hotel and Spa is an AAA Four Diamond Award and Forbes Four-Star Award-winning internationally inspired all-suite, dog friendly boutique hotel that appeals to guests who love the energy and excitement of Las Vegas, but choose to enjoy it from an exclusive, non-gaming, smoke-free environment. Ideally located, Vdara Hotel and Spa is steps away from ARIA Resort and Casino and connected to Bellagio and offers contemporary interior spaces with the very latest modern amenities and services. 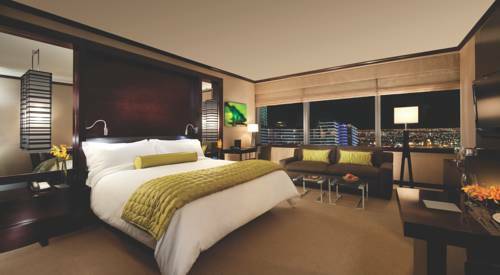 Vdara boasts 1495 suites that are luxuriously appointed with open floor plans and horizontal windows that deliver expansive views of the Las Vegas skyline. For added convenience, each unit features a full kitchenette. Vdara offers amenities commensurate with the most elite resorts in the world. Escape to a journey of holistic health at ESPA at Vdara and Salon Vdara, an eco-friendly, 18000-square-foot, two level spa, salon and fitness center. The intimate boutique experience that is found at every turn of the hotel is also found at ESPA at Vdara and Salon Vdara. Satisfying selections to suit every taste abound at the various dining options offered at Vdara Hotel and Spa. Market Cafe Vdara features classic American dishes with a European twist through a menu of freshly prepared breakfast available all day, lunch and dinner options, while VICE VERSA Patio and Lounge provides the ideal setting to pair a light appetizer with a handcrafted cocktail or enjoy a nightcap. To satisfy caffeine cravings, Starbucks is conveniently located next to Silk Road. Around the clock in-suite dining is also available. When it is time to hit the links, Vdara guests receive access to the most exclusive and beautiful courses in Las Vegas, including Shadow Creek. Maximum stay at property is 29 nights. Market Cafe Vdara: Market Cafe Vdara is a modern cafe and boutique grocery store that features classic American dishes, freshly prepared breakfast available all day, lunch and dinner options, and gourmet groceries. Drop by this cozy eatery for a quick bite, sweet treats, gourmet groceries, healthy snacks and wine. Pool and Lounge Vdara: Enjoy handcrafted cocktails, appetizers, and casual menu items poolside while overlooking the stunning views of ARIA Resort and Casino. Pool and Lounge Vdara offers traditional, yet healthy and fresh gourmet tastes in a refreshing outdoor setting. In-Suite Dining: Whether you wish for a hot breakfast, light lunch or a sumptuous evening meal, our In-Suite Dining services are available 24 hours a day. In the comforts of your suite, savor a menu of inspired creations. Starbucks: Starbucks has partnered with La Boulange Cafe and Bakery, a San Francisco gem, to provide you with the finest pastry and food that go alongside the coffees and teas you love. Ideally located steps away from ARIA Resort and Casino and connected to Bellagio in the heart of the Las Vegas Strip. Mount CharlestonMountain Retreat and Lodge 45 miles north west of Las Vegas.